Left 4 Dead was a landmark sensation in 2008. Introduced at an era before an avalanche of Zombie-themed games, movies, dramas started to flood the market and screens, it was a simple-to-jump-in cooperative multiplayer. In various game modes, players can choose to play as humans or as the Infected. Left 4 Dead became a huge hit in LAN (Local Area Network) videogame cafes, especially when it grew in popularity among girl gamers. 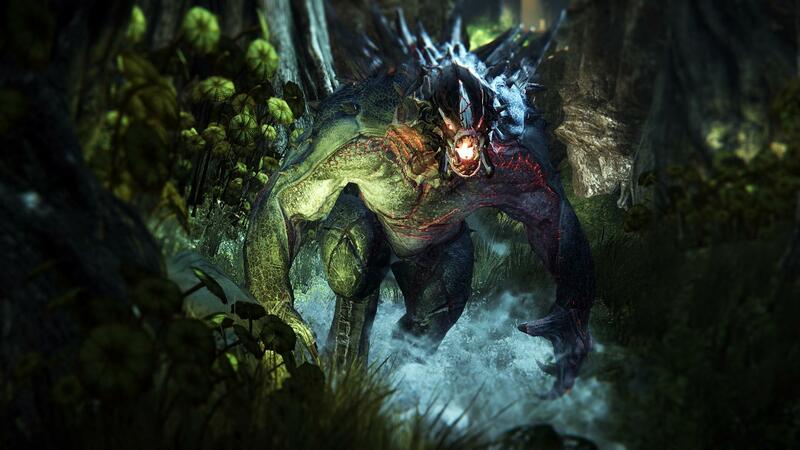 The creators of that game have now put together EVOLvE, scheduled for release in late 2014. While it is also a cooperative multiplayer, the characters are significantly different from Left 4 Dead. It wasn’t obvious at first, but I thought it was pretty clever when I read about why the logo was designed in such a way, especially when you see it being animated in the trailer. That also means that the EVOLvE is primarily 4v1 (Hunters vs Monster), although it is not necessarily so all the time (more on that below). Named The Shear, the map is one typically dense and dark jungle overlooked by a huge waterfall that leads to caves and ravines. Populated with a variety of foliage and rocky formations, traversing the area is dangerous without a torchlight, but that would also giveaway your location from afar. If you’re not careful, it’s easy to slip into the deeper ends. Fortunately, each human player has jetpacks, so it’s easy to fly up back on track. The jungle is filled with other lesser creatures, probably half mutant. Bird-like creatures will shriek and fly away upon being startled, causing a commotion that can be tracked from afar. Small dinosaur-like creatures will attack the Hunters in packs, but will flee from the Monster because they are a source of food. There’s also a medium-sized creature (crocodile?) minding its own business at the waterfall bank, until it is provoked. In one corner, sits a large defenceless multiple-platform plant housing a generator that is crucial to the mission. Collectively known as Hunters, we are introduced to four characters from each class, just like those you see from the trailer. We are advised that there could be more characters to choose from in each class, allowing multiple combination and a fresh look. All Hunsters are played in first-person view, but unlike Left 4 Dead, iron sights are enabled. Objective players would eventually pay more attention to the class abilities, which ranges from Assault, Support, Trapper and Medic. While they each have varied arsenal, teamwork is key to defeating the monster. VAL, the Medic will aim to keep the team alive. She has a MedGun that can be fired from a vertical or horizontal position directly to her teammates, one at a time. She also has Healing Burst, which heals those within a small radius. She can fire the Tranquilizer Rifle to slow down and weaken the monster, or use an Anti-Material Rifle to pierce the monster’s armoured skin, creating weak spots for her teammates to focus on. MARKOV, the Assault is your heavypower. His Lightning Gun deals damage at close range, while his Assault Rifle allows him to shoot from a further distance. His electrically charged Arc Mines can be planted around the map. (Protip: I’ve seen 7 mines stacked together during the demo, believed to be amplifying its damage). For defence, he has a Personal Shield to be invulnerable momentarily. HANK, the Support seems to have a balanced skillset. His Laser Cutter deals damage but his Shield Gun makes his teammates invincible for a short period of time. He has a Cloaking Device to make his teammates invisible, and my personal favourite is his Orbital Barrage air strike – just aim at a target and fire. GRIFFIN, the Trapper has skills that is not seen in other games (because it’s effective against Monsters). He can launch Sound Spikes to alert the team of the monster’s movements. His Harpoon Gun prevents the monster from getting too far away, supported by launching Mobile Arena which traps the monster in one area of the map. To support the team in firepower, he has a cool-looking submachine gun. 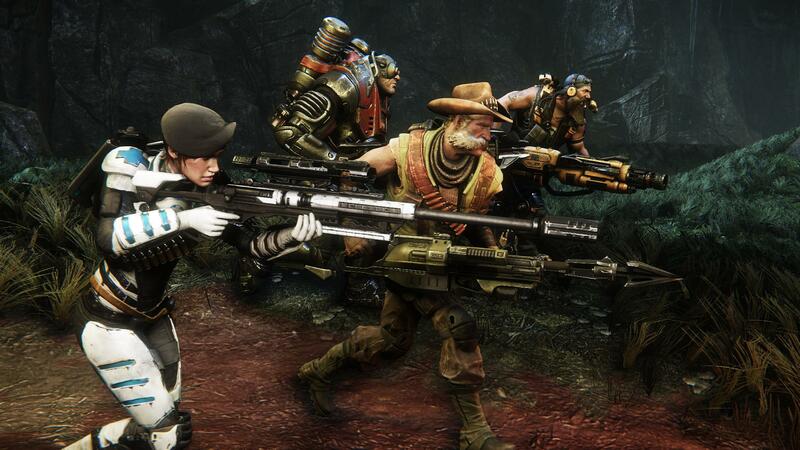 A basic strategy goes like this: Support may want to make his team invisible while Trapper launches Sound Spikes as the team moves about together, slowly. The idea is not to give away their location easily. Once the monster is in sight, Assault would direct their firepower to bring down monster’s health to zero, with Trapper firing a harpoon to prevent the monster from going out of sight. The harpoon slows down the monster, but the monster can sever the tether if it is quick, all while taking damage. The monster may usually try to make its escape which the Trapper will attempt to enforce a force field dome, ensuring that monster is not able to go beyond a defined circumference. All these while the Medic, who appears to have a weaker armor, evades any direct contact and using a Medgun to continuously replenish the health of her teammates from afar, horizontally or vertically. The Medic is also able to create weak spots on the monster by firing through her Tranquilizer rifle. As the monster is slowed down or trapped in a corner (possibly with another shot of the Harpoon Gun), Support would let Orbital Barrage rain onto the monster. The monster we are introduced to is named Goliath, which embodies a familiar rendition of a walking two-legged grotesque beast with powerful arms. Depending on the chosen abilities, Goliath is able to perform specific actions such as attack charge, rock throw, fire-breathing and strong leaps, along with secondary abilities such as faster feeding and armor boost. Stomping around will leave giant footprints that can be tracked but it can convert to Stealth (crawl mode) and stop leaving tracks. This can cause confusion to the Hunsters, and due to the multiple-level terrain of The Shear, there are ample opportunities to create diversion. Due to the sheer size of the beast, the monster is played in third-person view. It appears that more monsters will be unveiled and each of them may require different approach and tactic. Cool! In the game mode available, the monster’s objective is to feed and evolve in the first two rounds, and once he reaches level 3, he can go all-offensive at the base to destroy the generator, leading to the next progress of the mission which is to eliminate a group of scattering scientists. The first two rounds requires the monster to play sneakily, and confuse the Hunters. Every time the monster attempts to kill and devour the lesser beasts, there is a danger of causing too much commotion and noise. The Hunters can scatter Sound Amplifiers to alert them of such, even if they are at the other end of the map. It may seem an unfair advantage, but the monster can lead the Hunters to other forms of distraction such as crossing the path of the quiet-unless-provoked beast by the bank. Such diversion allows the monster to escape by leaping across the terrain within seconds. Although the Hunters have jetpacks, they are limited by cooldown time. Based on the preview of four-stage-multiplayer build, the match can either end quickly in the first round or last until the fourth stage. It depends on the teamwork of the Hunters, the skill of the monster (player) to create panic and scatter the team members and the familiarity of the players with the map and how it is used to their advantage. It is also refreshing to switch from the first person view of the Hunters in one match and then play in third person view as the monster in another. 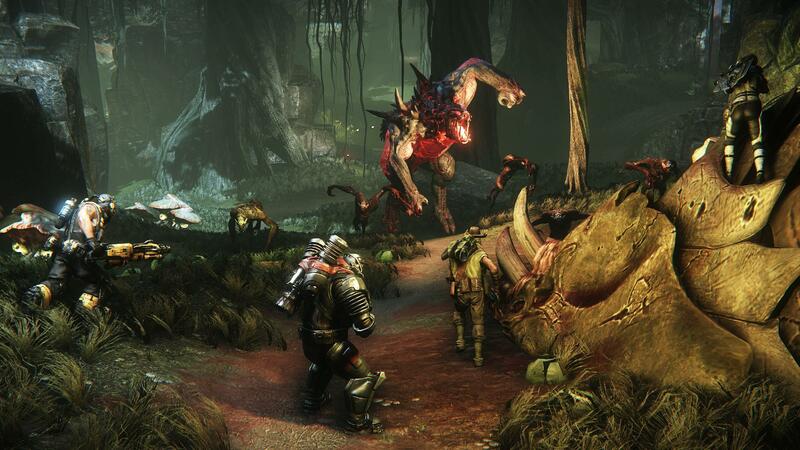 EVOLvE will be available on XboxOne, PS4 and PC this Fall. While EVOLvE provides another reason to own the next-generation consoles, I believe it will be receive faster adoption among our PC brethren. I won’t be surprised if EVOLvE is the next title to sweep LAN cafes by storm as we approach the Fall holidays of 2014, in the meantime I hope we don’t have to wait too long for the next reveal on this game. 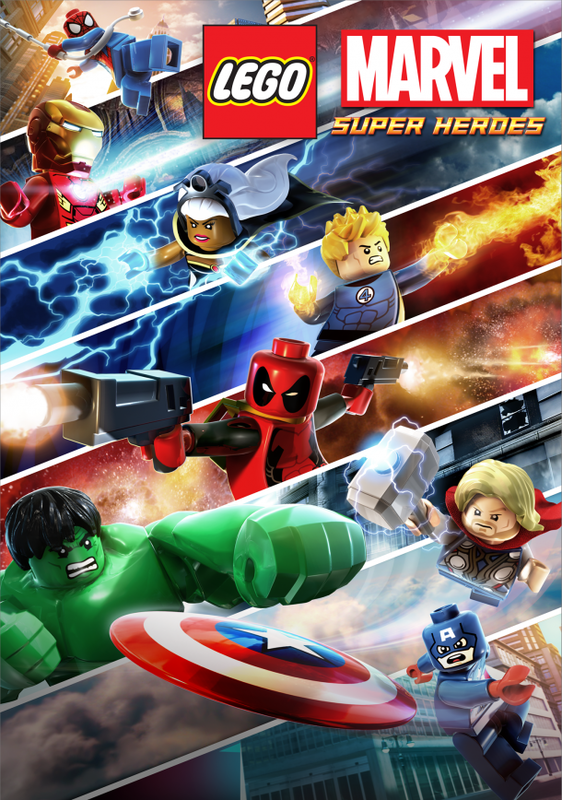 Lego: Marvel Super Heroes (MSH) joins the legion of Lego movie-based titles released over the years and undoubtedly offers the best of past game mechanics, expanding on its replayability and unlockables. While the plot of past movie-based versions is able to be conveyed through Lego’s trademark mimes, MSH chose the right path to incorporate voice work to aptly portray the multiple personality and wit of its superheroes. The game starts off with a few controllable superheroes and after some basic hand-holding, players are left to explore on their own. The plot is to foil Doctor Doom’s plan and this leads to various locations and situations. Midway, you will gain access to the Helicarrier, as seen in The Avengers movie, and a rendition of New York City available for free-roam with side missions. As you progress through the plot, access to more superheroes becomes available, but while completing each episode grants you access to the new super-friends, a handful is only unlocked through completion of certain objectives. But this is the least of worries, as compiled Lego studs through playing through consolidates into an in-game currency, allowing you to purchase unveiled characters. No real money is involved. The completist behavior in you (and those who have played Lego videogame titles) would know that the key in such games is to smash as many Lego structures as you can to collect Lego studs. 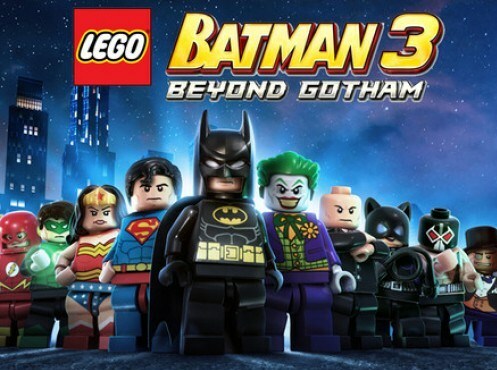 Gameplay soon becomes a conscious effort of smashing Lego structures along the way with an aim to score a full 100% of collected studs in each episode, as this allows you to replay the completed stage at your own pace and also swap the active team with other unlocked characters from the roster. However, you will eventually notice that while there are many superheroes to summon, the abilities are somewhat preset into a few categories. This is done to fit the puzzle requirements of the map. Granted, while Spider-man and Venom have similar functions within the game, they each have distinct look and animation. Seasoned players would know that in any given stage/episode, there are many alternate paths and side quests, thus providing an incentive to replay them with different team of characters. The joy of playing Lego SMH is uncovering the new superheroes as you progress and seeing how their look and animation are translated in the Lego world. For example, Hulk has the familiar swing-slam animation which he carried out to Loki in the movie Avengers. Tony Stark’s Mark V flying armour collaboration somewhat reflects the one you see in Iron Man 3. Thor has his trademark spinning Hammer animation as he takes off, while Wolverine has a distinct throw-slice animation that you would have seen in his movie. These are the little touches that make the game great. As always, there is no online multiplayer and the game is playable in two-player local coop. This means that someone is the same room can join in to wreak havoc with you. Alas, instead of a fixed camera view, the developer adopted a rotating camera view which we feel is confusing and concentrating-straining. Some players may be able to adapt to it, but if you’re a parent juggling multiple tasks at the same time, you may not be able to focus on your character. Most of the time you will probably be wondering where your superhero is. If you’re introducing this game to a young person, I would recommend playing a couple of stages on your own first and then guide him/her through. Once he/she is able to grasp the concept, you can then sit back and watch as they discover their way around. Lego SMH makes a perfect gift for Christmas or birthdays. Available on Xbox360 (reviewed), PS3, PC and possibly on next-gen consoles. [ Note: The contents here SPOILER FREE] Three days after my first playthrough, I am still ‘infinitely bio-shocked’ from the conclusion of the story campaign. 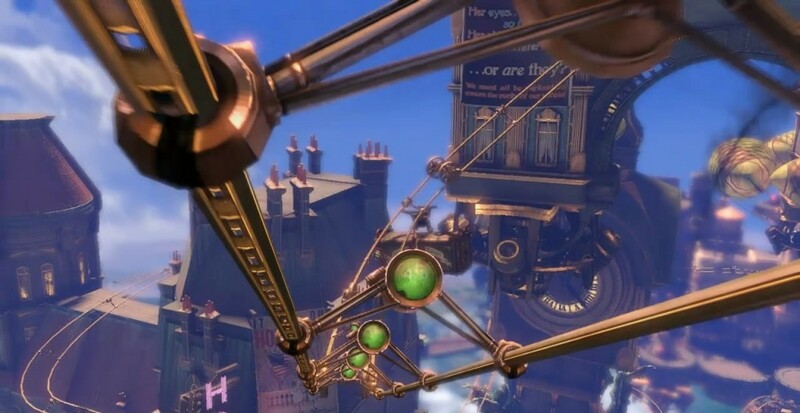 I admit that prior to its launch, I was very sceptical about the game being set on another world that is opposite from what we’ve seen from past two Bioshock games. When the first Bioshock was launched, I recall the game was highlighted for being the first game with excellent water effects. This was further enhanced with the Bioshock 2’s ‘There’s something in the sea’ campaign that went viral pretty well. Add that with Thalassophobia, my personal phobia of large masses of water such as the ocean, and this is a game other than Dead Space that will always cause a layer of uneasiness to me while playing. 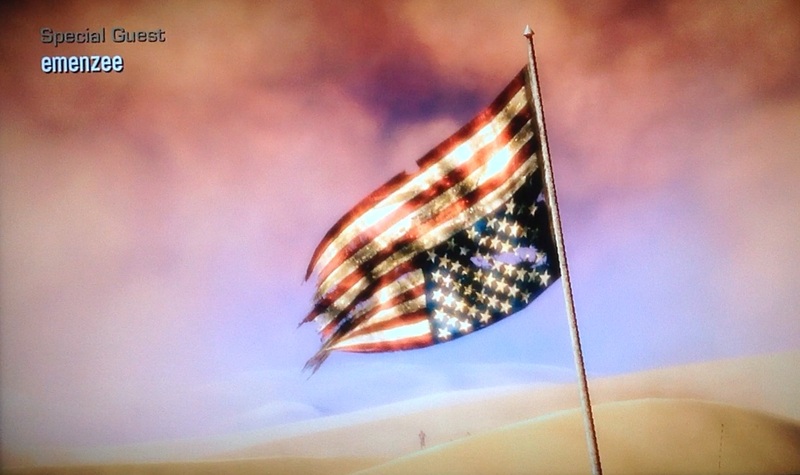 With Bioshock Infinite, I felt a different kind of uncertainty in the first few hours of the game. To me, the build up was slow until my first encounter with Elizabeth. Maybe it’s because I’ve been hearing so much about Elizabeth from the pre-launch videos and I’m desperate to meet her. The tension began to escalate as the plot thickens, and with the discovery of Vigors and weapons, it became the Bioshock that I was familiar with. At this point of time, I am quite settled down in the game. I stick to switching between Murder of Crows and Possession because the game allows easy switching between two recently employed Vigors. For weapons, I had to take a different approach as some areas were just littered with specific weapons so being an average shooter, I sometimes use up my bullets too quickly and had to resort to other arsenal with a steady supply of ammunition. Much of the items in Bioshock Infinite mirror the features from BS1 and BS2. The right hand is for weapons handling, while the left hand is for casting chemical induced spells. Although they’re named differently, there’s similar to the counterpart items in the past titles. I even wondered the rationale for the new names. Little did I know that all these will be answered and much more. The skycity of Columbia didn’t draw me in as much as the dark corridors of Rapture. Perhaps because it appears more expansive. Many times, I’m quite lost on where to go and had to rely on the objective arrow to lead the way. I have mixed feelings about the Skyhook, an accessory for the player that was not seen in BS1 and BS2. Understandably, the device is irrelevant underwater. However, as much as it is a weapon and a means of travel, the potential of the device feels underwhelmed. While attaching to the skyrails, the hook instantly wheels you along until you bump into an obstacle or a dead end. The first time it happened, it felt great. I could almost imagine the wind while hanging freely and watching the city from a bird’s eye view. After a few rounds of wheeling though, I start to notice its shortcomings. You can make it slow down but you cannot stop midway on the rails. This reduces my element of surprise because by the time I approach an area, I had to decide to dismount quickly or risk landing too near to attract unwanted attention or landing on a disadvantaged spot, especially when the story dictates a bounty for my capture. I guess it helps if the Skyhook wheeling can be manually activated and stopped at the player’s discretion. This reminded me of Batman’s videogame (Arkham Asylum and ArkhamCity) that has a similar arsenal but which can be upgraded later on to allow the player to pause midway. 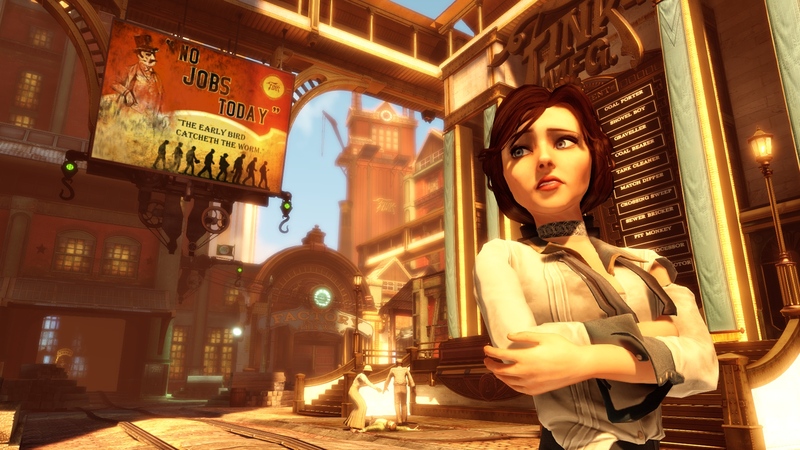 Keeping with tradition, Bioshock Infinite remains a first-person shooter. However, for a game that constantly invokes the feelings and mood of the player, a visual expression is needed from the player’s point of view. 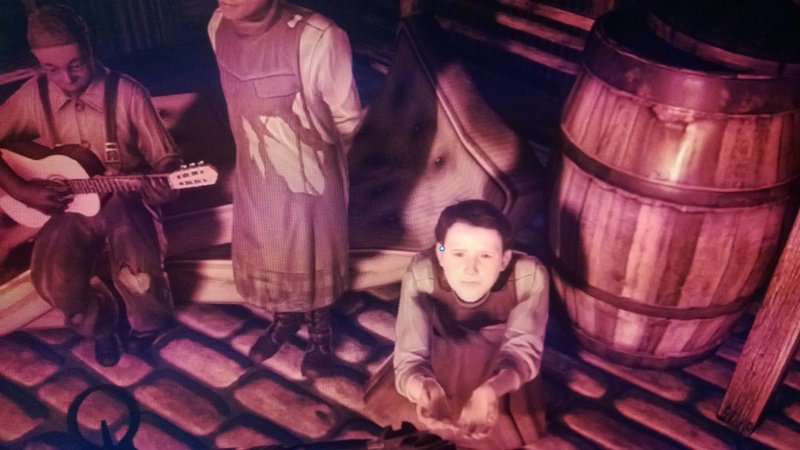 While the game may intend the reaction to be personal, thus coming from the human player directly, I feel that the adding a third person perspective of Booker would enhance his connection with Elizabeth. 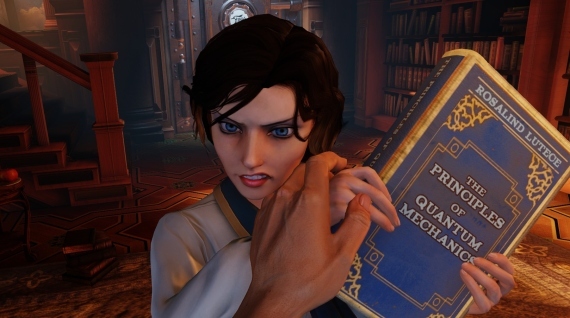 Many times Elizabeth is seen staring back at Booker (me) with a multitude of facial expression, and I wish there was a way I could see how Booker reacts. Dead Space recognised this and had evolved their Isaac character. Without discussing on her role in the plot, Elizabeth is an example of an ally that many games should emulate. She interacts, offers her opinion, scouts resources and hands them over to you (if you allow it). She has the nose to spot items like the dog in Fable II but with a similar resurrecting power of Erika’s from Prince of Persia. Having a girl pulling you up and saying something is always more uplifting than having to walk through a door (when she’s not on your side). Plus, you don’t have to carry her around like Erika. And she sings too, if you didn’t miss the guitar. My other quip with the game is that while the Voxophones can be replayed separately through a menu, launching it immediately during the game does not trigger any visual text of the played message. While you’re busy scavenging the room and perhaps triggering some in-game dialogue in the process, the focus on the Voxophones is affected, thus probably contribute to missing clues and details on the story. Perhaps this is meant to get the player to absorb the story fillers slowly, but when I play the game late at night, I usually keep the TV volume low and this affects how much I can catch from the Voxophones. This means I should set up my headphones, but I would like to have that as an option, not a necessity. The final minor letdown I have with the game is that when I was getting very much engaged with the atmosphere, my interaction is still scripted. I don’t mind the restriction of being able to only open certain doors, but there was an episode when I would like to make a contribution to the kids in the game. They were extending their hands to me but the game wouldn’t let spare a few silver eagles for them. If Elizabeth can throw me some coins, I would like to do the same to these kids. That aside, other elements of Bioshock Infinite that contribute to the story deserve much praise and awards and I like the conclusion to the plot. I beat myself for not paying attention/spotting the signs along the way but it leads to an understandable closure that is still open to interpretation. Nevertheless, there might be elements of the plot that may remain a mystery (from the articles I read) which presents an opportunity to be enlightened through downloadable content. A note to those who have not played/finished the game – don’t skip the credits! Bioshock Infinite has no multiplayer, unlike in Bioshock 2, but this is a game which doesn’t need one. 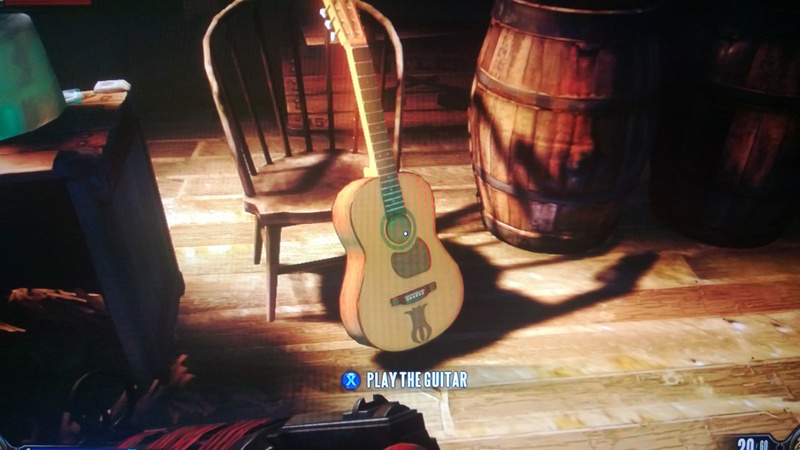 Play it for the plot and easter eggs. 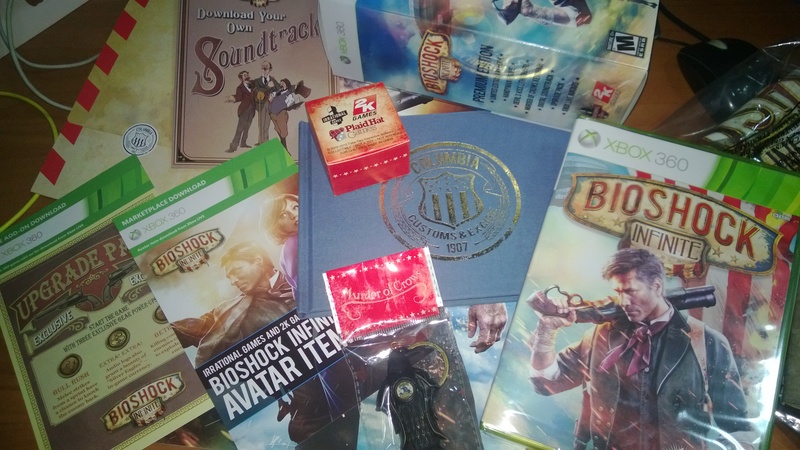 Xbox360 version of Bioshock Infinite was provided for review. The original Assassin is back. That’s what you see in the trailers of Hitman Absolution. It’s an obvious stab to the recent attention-grabbing franchises in the form of Splinter Cell: Conviction and Assassin’s Creed sequels while our bald stone-cold killer has been in hiatus since 2006. That bold statement makes his return very much anticipated. But are we getting the same Hitman game that makes him distinctive. While I’d give it a nod, there are a few elements of game design that makes Absolution deviate away from what I experienced in Blood Money, one of the titles that made owning an Xbox360, the only next-generation platform then, very convincing. Absolution extends its reach by making it also available for PC and PS3. Having played a few Splinter Cell/Metal Gear games prior to Blood Money, I was attracted to adopt the approach as it was not a sneak-in-the-shadows game. Agent 47 was able to utilise disguises to advance closer to his target and choose from multiple ways to eliminate his target. He would receive his missions through a safehouse and then decide on the arsenal to employ. In Absolution, the formula remains to a certain extent, with a couple of tweaks. Agent 47 now moves more naturally and is able to take advantage of an effective cover mechanic. This is much welcomed than having to strafe around to dodge bullets in Blood Money. Agent 47 is also known to be able to employ various disguises and there’s a lot more to costumes and attires to discover in Absolution. Realistically, unlike in Blood Money, wearing costumes does not mean you’re totally safe. I like the added challenge in that other characters in the same profession can recognise you if you come too close, but it appears that some of them can spot you from far. I remember a scene in Blood Money where Agent 47 disguises as a worker carrying a crate of drugs to get past a guard. The guard was more interested in checking out the goods that Agent 47 was holding than verifying his identity. Granted, that may be too easy in a game, but I had no problem with it. In Absolution, there was a scene in a hotel in which Agent47 is wearing a worker costume in a dim basement. A guard was approaching him and shining his torchlight towards him but did not detect anything suspicious. But another worker who just walked into the room and is about ten metres away was giving out suspicious markers towards the Agent. Didn’t the game tutorial say this happens when you get too close? This is one of the game breakers. It keeps you on your toes about your surroundings. Even so, Absolution’s A.I. is not very intelligent. In a subway mission, I was cornered in a room where a body of a police officer was found. The room was pretty empty except for some fixtures and a large cabinet. This is one of the many areas where I could have hidden the body but I didn’t have enough time. I managed to hide inside that cabinet and when the body was found, a dozen of officers from various teams stormed into the room looking for clues. But none was smart enough to check the cabinet. While peeking, I even spotted an officer looking in my direction, yet somehow he did not bother to check. And speaking of the cabinet, there is always enough room to hide two bodies with Agent 47 to squeeze in, but somehow it doesn’t allow me to hide three bodies. That’s an awkward game design. If you want to aim for high ratings after each mission, you would have to be unspotted and performing clean kills. Achieving that would require plenty of trial and error, and multiple restarts. Even if you manage to score impressive ratings for a mission, there are other challenges to be unlocked. A challenge may require to wear all possible disguises while another challenges you to remain with your trademark suit and tie, or adopt a specific method of execution. This is aside from the hidden items and collectibles. Bottom line, there’s plenty of replayability for every mission. In a Chinatown mission, I discovered that food poisoning is one of the options to employ in eliminating a target. But I chose to detonate his car while the target visits his vehicle. That’s one of the beauty of Hitman games. Firepower is not the only course of action. The one notable addition in Absolution is Instinct. This is earned as you play through but can be expended to track nearby human movements, ala in Batman games. Instinct is also able to tell you their intended paths of those approaching you. Otherwise, Instinct is depleted when you need to blend past suspecting figures in order not to blow your cover. Compared to Blood Money, Absolution has raised the bar in terms of graphics and immersing you into a real believable world. In Blood Money, the crowd comes in small groups, but many scenes in Absolution are able to render larger crowds without a hitch, thanks to an upgraded Glacier engine. I was blown away when I had to sift through the large crowd in a Chinatown mission and at a subway. The crowd actions are pretty varied unlike in a sports game that I was reviewing recently. The environments are all well-detailed. It appears that IO Interactive had combined the ideas from previous Square Enix releases such as Kane & Lynch and Sleeping Dogs. Voice work is also great. It was great to hear Agent’s 47 trademark voice after watching a non-related Hitman movie which stars a younger Agent47 sometime back. There’s plenty of dark and humour in the dialogue of nearby non-playable characters as well as during the cutscenes. However, while Absolution puts you directly into a plot from the beginning, I’m missing the interesting story lines from Blood Money. I still feel sorry for the plight of the manager of the theme park, especially when my actions and methods of execution indirectly influenced the newspaper report following each mission. Sadly, this is absent in Absolution. Nevertheless, I’m enjoying every bit of hard work I had to do (observing movement patterns, looking for clues and alternative methods of execution, exploring the premises) to complete each mission and while my initial score is unimpressive, I hope to do better in my subsequent playthrough. Absolution is also packed with Contracts mode which is involves comparing your scores against players online, but I have yet to experiment it. Stay tuned for my next write up. Meanwhile, if you love being an assassin in videogames, you can’t go wrong with Hitman Absolution. Expect to spend many hours with it. I have been blogging about games and related materials since 2006, and recently I decide to venture into an area that I can contribute and at the same time, give me a chance to work on my mother tongue – Malay. So, in commemoration of the release of one of my anticipated games of 2012 – Spec Ops: The Line, I decided to write about the game in Malay. This is my ‘virgin’ attempt to write in Malay after so many years, so please forgive the errors in language and grammar. You can read about it here. However, I would love to hear your comments. 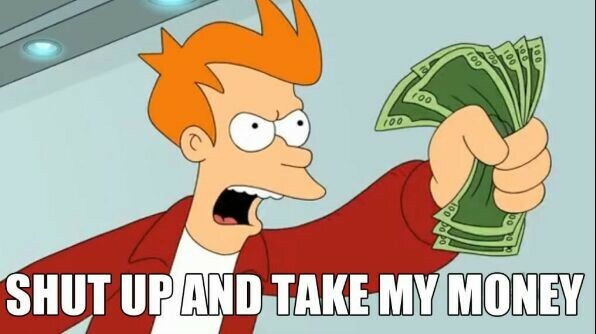 Unless you’re on the ‘VERY-EARLY’ list of preorders from your favourite gameshops (different arrangements may apply), or if you’re willing to fork out a huge sum (last i heard, around S$300 or above) it is almost impossible to get your hands on one. But you’re a fan of Diablo, and it is imperative that you own something ‘limited’ that is related to Diablo III. 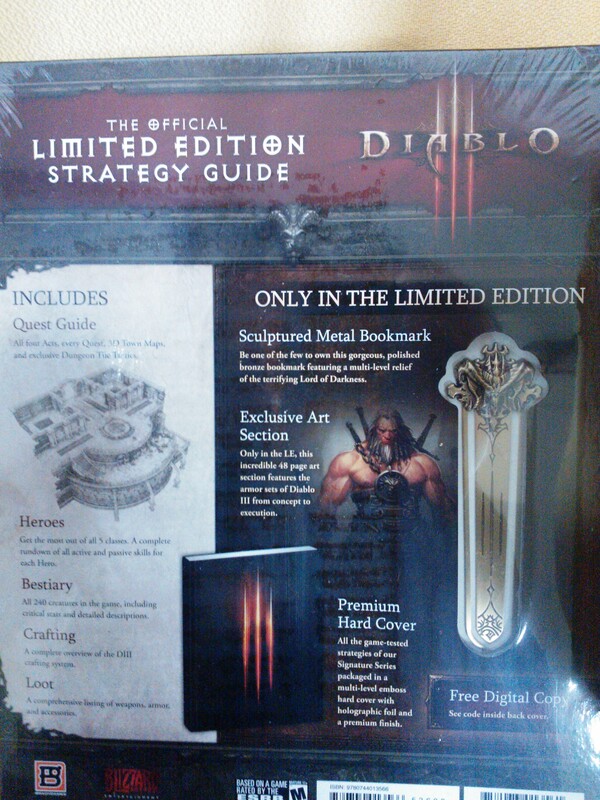 Well then, perhaps, you may want to consider the next best thing – Diablo III Limited Edition Guide. How about it? It’s an Official, limited edition guidebook with a rare polished metal bookmark with a sculpture of that demon head in the Collector’s Edition. According to the product description in Amazon.com, this sealed-so-you-can’t-peer-into-it guide is packed with tons of useful information, including ‘how to get better loot’. The retail price is currently unknown, but there will surely be demand for this, and the looks of it, it should be easier to access than the Collector’s Edition of Diablo III. You could call your favourite gameshop now to place your interest, but do it soon. It won’t be long before this becomes another rare collectible item.